Sport is often regarded as male dominated with more male sports teams than female ones and more male sports coverage in football and rugby media, to give just two examples. However, our recent research shows that the sporting world is becoming fairer, with improved female sports coverage and more female sports team than there were in previous years. In Opinium’s survey of over 2,000 UK adults, we asked people what they thought about women in sports and female sports in general. 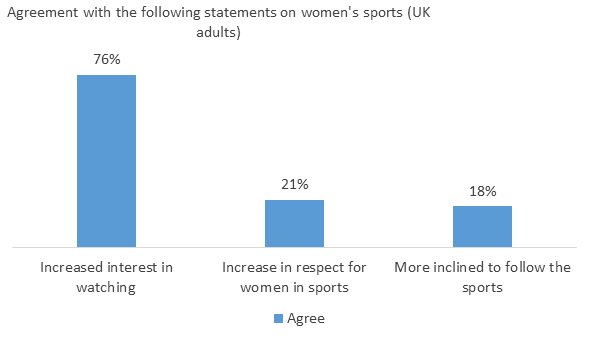 Three in four (76%) UK adults think that interest in women’s sports has increased discernibly over recent years, with a further three-quarters (77%) saying that this interest is likely to increase even further. Interestingly, nearly half of all the men surveyed (45%) admit that recent coverage of events – such as the Women’s World Cup – has changed their perceptions of female sport, including an increased respect for women’s sports and a greater inclination to follow women’s sports. Just as interestingly, a fifth (22%) of women say that media coverage on female sports has actually inspired them to try a new sport themselves. However, despite the increase in interest, the findings also showed a difference between men and women regarding how women should be treated in sport. For example, when thinking about whether women should receive pay and prize money equal to that of their male counterparts, three in four (77%) women say that they should compared to only 53% of men. Opinium Research carried out an online survey of 2,002 UK adults aged 18+. Results have been weighted to nationally representative criteria. The research was conducted from 31st July to 3rd August 2015.